As readers of this blog, you probably already know that Kindle Fire devices run Android. While these devices may not look like Android because we use an Amazon-designed launcher, they are Android indeed. The original Kindle Fire released in 2011 runs Gingerbread (API level 10) and the Kindle Fire devices released in 2012 run Ice Cream Sandwich (API level 15). What you may not know is how easy it is to get your existing Android apps up and running in the Amazon Appstore on Kindle Fire and other Android devices. We recently tested more than 1,600 app submissions to the Amazon Appstore Android tablet apps on Kindle Fire. In our tests we found that more than 75% of these apps just work on Kindle Fire devices with no additional development required. While some developers may choose to just submit their Android apps, others may also decide to integrate Amazon APIs like In-App Purchasing, GameCircle or Mobile Ads to provide a richer customer experience and monetization. We’ve seen Android apps like ‘Match the Pics’ take minutes to get submitted to Amazon and others like ‘Temple Run’ easily integrate Amazon APIs with their apps. App functionality doesn’t match the product description. We’ve found that this is the top reason. For apps designed to run on phones, the app loses state or data when it receives a message or phone call. The app should preserve its state when receiving or placing text messages and phone calls. The icons don’t match. Sometimes, the icons submitted in the developer portal don’t match the icons included in the application. They need to match. App stability or failure to launch. One in 20 of the app failures is stability related. For example, because the SD card path is not necessarily the same for all devices, assumptions about the SD card path can cause failures. Another common example is failing to include referenced libraries. Not replacing unsupported APIs with the Amazon equivalent API. Security. One example we’ve seen is writing plain-text login credentials to the log. Apps need to be secure for customers. Since your app will most likely just work with zero development effort in the Amazon Appstore, it seems like a no-brainer to create a developer account – at zero cost - and submit your app. Take a look at what one of Amazon’s Appstore developers says about how easy it is to set up your account and submit your Android app. 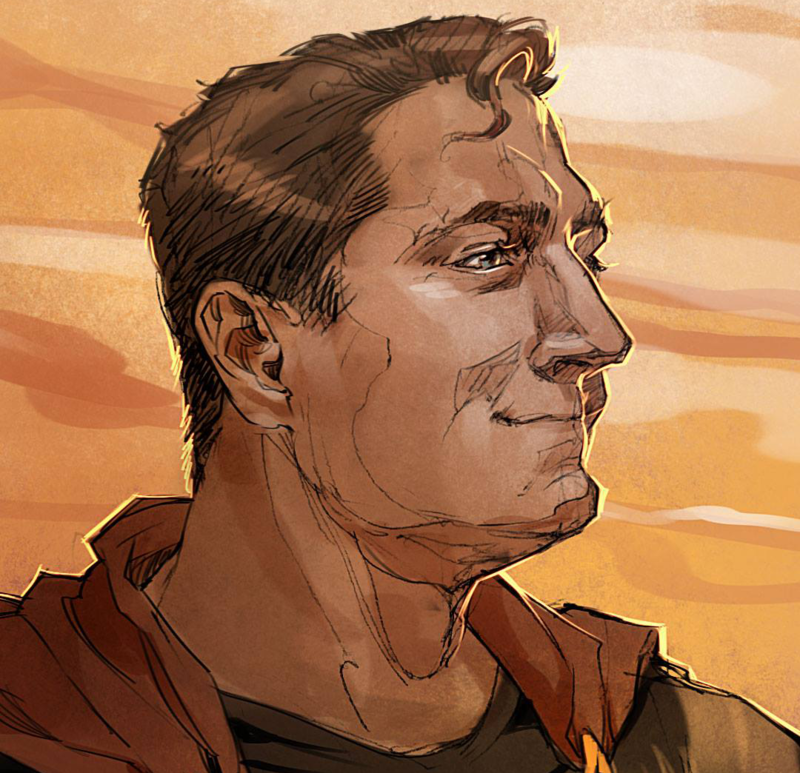 Some of the details went by fairly quickly in the video. 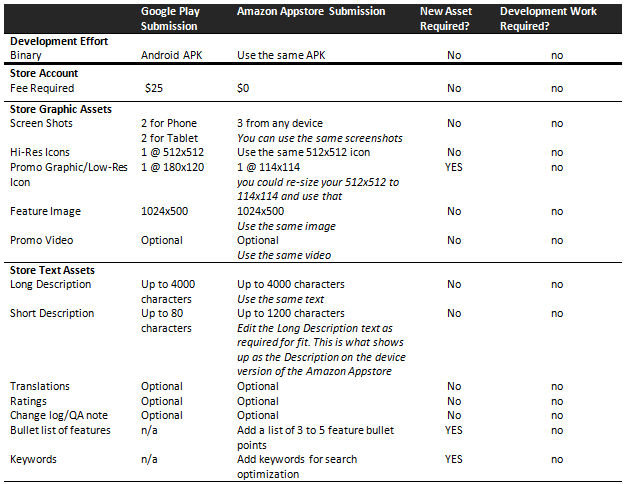 Here’s a comparison summary of the assets in a Google Play submission and how they transfer to an Amazon Appstore submission. It’s really not hard to have your app fly through testing. Just open a developer account on the Amazon Mobile App Distribution Portal today. You can then start submitting your existing APKs to the Amazon store, exposing them to new customers in nearly 200 countries worldwide.